14 start-ups gathered at CIC Monday night. As over 100 guests piled into the Havana Room, Bertrand Diard, CSO and co-founder of Talend, opened with the story that begins in France circa 2006. Today, Talend is only second to Red Hat in terms of open source vendors, and with a robust groundwork to make US partners they have attracted 4,000 enterprise customers worldwide. We also had Astra Zeneca’s Sr. Principal Informatics Scientist of Big Data Analytics, Nirmal Keshava PhD present on the company’s needs in terms of analytics. They currently focus on Next Generation Sequencing (NGS): identifying key workflows, tools, and analytics for analyzing internally or externally-sequenced NGS data and Real-World Evidence (RWE): utilizing very large sets of transactional data from payers (insurance companies) to derive inferences about utility of drugs in general population. This is the next generation of health meets data. 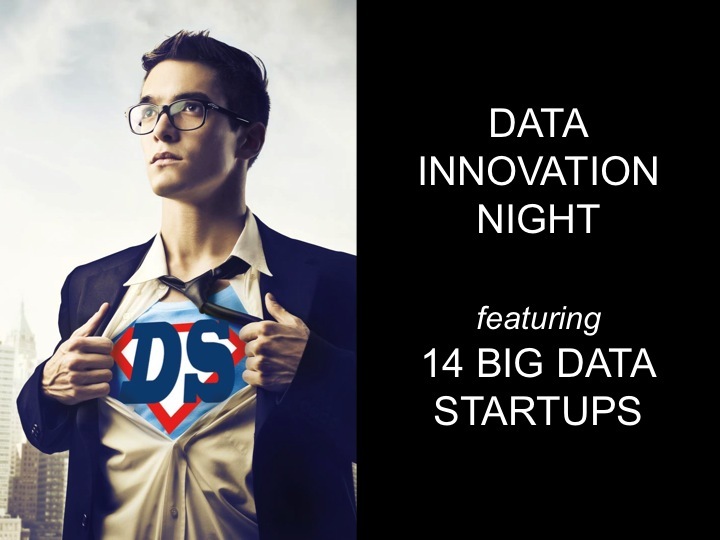 Data Innovation Night also ran rapid-fire pitches alternating between 7 French start-ups and 7 American start-ups. Catherine Havasi, CEO of Luminoso provided a novel diagnosis of a key problem with computers & data, the discrepancy in language, interpretation of results that require a more creative, human approach. Luminoso is a service that sprung from MIT media lab, providing companies a way to “put the text in context” relying on actionable insights based on concept-based analytics. Flown in from Paris, Co-founder, Marc Batty also presented to our audience the Dataiku Data Science Studio. In fact, Dataiku aims at making Data Science easier and more productive for any kind of organization and company relying on visual and interactive tools that allow analytical teams to innovate and be creative with data. Co-founded with Florian Douetteau, they believe in data that is both visual and interactive making information accessible for any user. Ditto Labs– Discover your brand in the 500 million photos shared every day across the social web.